Discover the 2018 edition of Double Signature, a project of the Fondazione Cologni dei Mestiere d’Arte and Living Corriere della Sera. Its 13 collaborative works have been created by international designers working for the first time with Venetian master artisans. Medico dell’aria (Air Doctor) Masks Eight hand-modelled Venetian papier-mâché masks fitted with charcoal filters associate traditional comedia-del arte characters with a machine-like design. These ominous looking masks juxtapose historic imagery of the plague with contemporary issues of pollution. Stimulated by revival of the Carnival in the late 1970s, Sergio Boldrin founded La Bottega dei Mascareri in 1984 during the height of the revival. He and his younger brother Massimo create and finish their hand-painted masks following rich traditions and knowledge of a centuries-old craft that dates back to the 13th century. They are now one of the only remaining authentic mask makers in Venice. The masks are created by combining traditional elements typical to the creation of Venetian masks. The masks are modelled in plaster moulds, then decorated with acrylic or watercolour paint. The masks are created by combining traditional elements typical to the creation of Venetian masks. The masks are modelled in plaster moulds, then decorated with acrylic or watercolour paint. Stimulated by revival of the Carnival in the late 1970s, Sergio Boldrin founded La Bottega dei Mascareri in 1984 during the height of the revival. He and his younger brother Massimo create and finish their hand-painted masks following rich traditions and knowledge of a centuries-old craft that dates back to the 13th century. They are now one of the only remaining authentic mask makers in Venice. The masks are created by combining traditional elements, typical to the creation of Venetian masks. 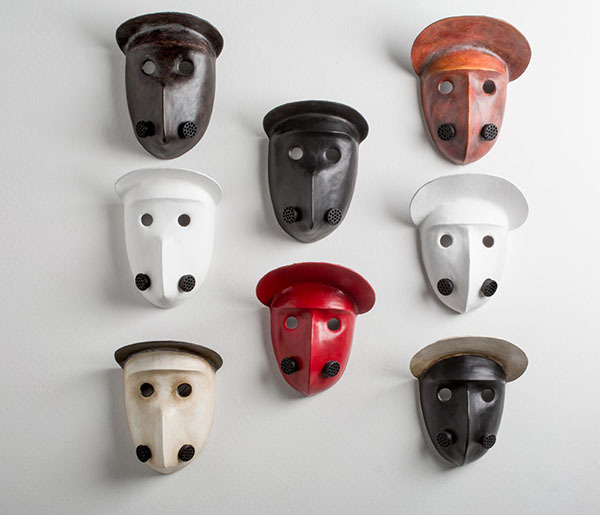 In an innovative and daring step, the masks are modelled in plaster moulds, then decorated with acrylic paint. When Sergio Boldrin grew up there were no mask shops in Venice. Making masks in papier-mâché became an exceptional way for Sergio to participate in a reborn interest in the craft. Sergio is also an accomplished expressionist painter who has featured work at the Biennale. His hardy Teutonic style allows him to balance his feeling about terrorism, predatory tourism and plastic masks from China with the joy and merriment of masquerade. 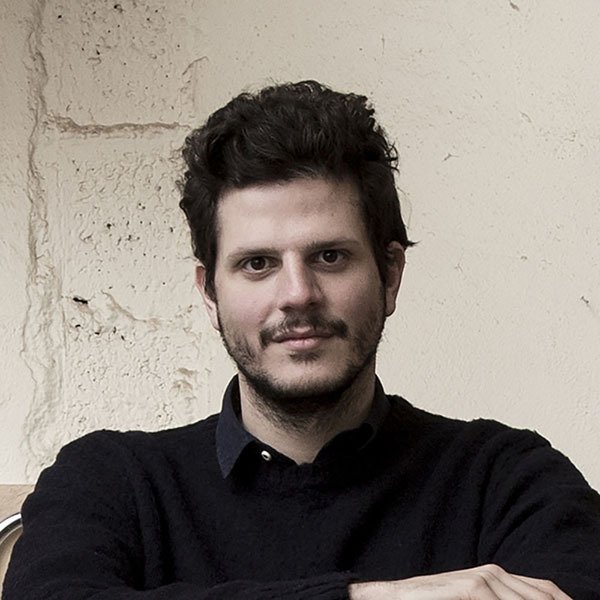 Philippe Tabet studied industrial design in France. 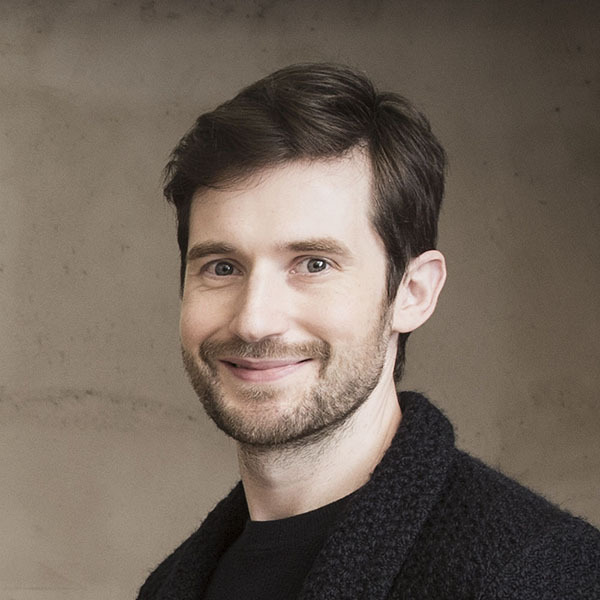 He worked in Paris for a global design agency, and then moved in Milan where he worked for a furniture and product design studio. He opened his own studio in Milan in 2013. 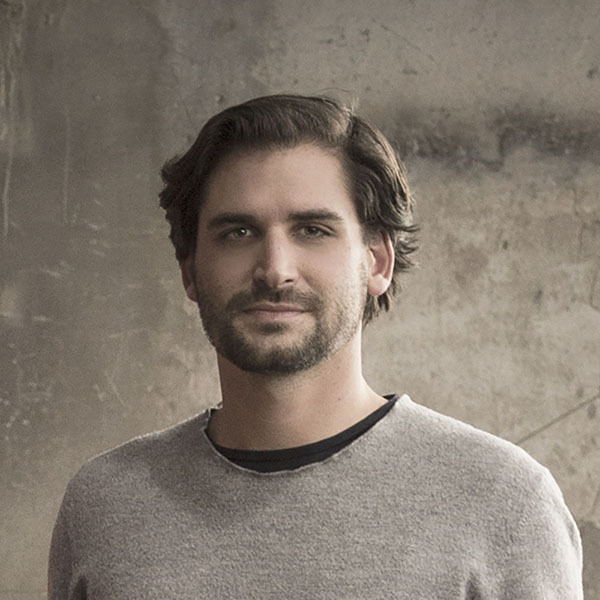 In 2014, he was awarded first place in the Infiniti Design Contest for his Ruelle brasserie chair made in aluminium and wood, combining modernity and tradition. He won first prize in the 2017 Young & Design contest with his Tool stool, made in rotation-moulded plastic by the Italian brand Plust, the result of a broader aim to reduce the volume of objects to a minimum. 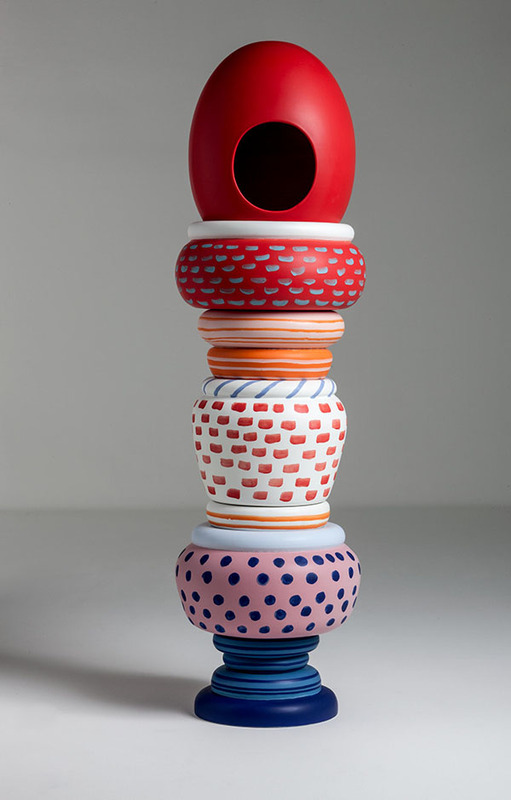 Woman in Love Ceramic vessel Four separate, colourfully hand-painted and glazed vase shaped ceramic elements combine to make a freestanding totem. The four elements can be detached from one another, and on their own become four separate vases. For Pepa Reverter this piece symbolises the energy and power to keep going forward in life despite obstacles. To do so means to be in love with life. The totem embodies cultures without a voice and the ceramic method honours artisanal techniques that can disappear if not taken care of. Woman in Love results from the collaboration between Spanish designer Pepa Reverter and Italian ceramist Mario Bertolin of Ceramiche Artistiche 3B. Pepa begins her design with a sketch that she then paints and finally transposes to a three-dimensional model. Then, using a potter’s wheel and biscuit earthenware “biscotto”, Mario creates the ceramic vases entirely by hand. The final fired vases are then painted by Ruggero Carlesso. 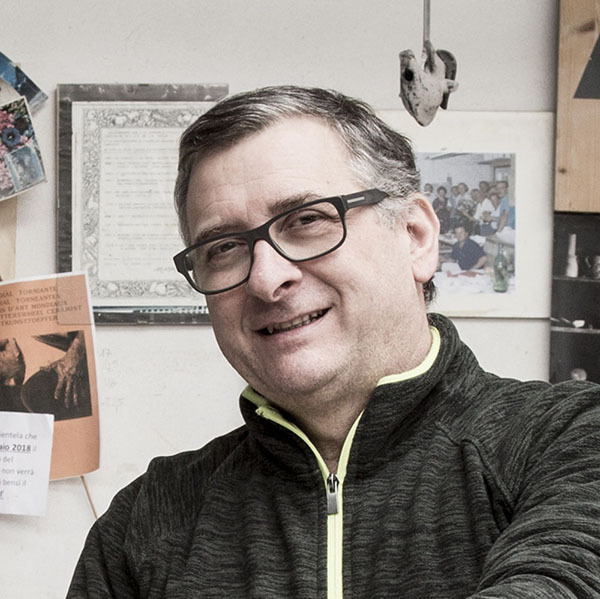 While Mario Bertolin’s grandfather and father worked clay with machines, Mario has dedicated the past 40 years to working exclusively by hand, continuing the rich ceramic traditions of the city of Nove, Vicenza. Mario, his brother Luigi and his uncle Severino co-founded Ceramiche Artistiche 3B in 1978. Mario’s brother and uncle have now retired so he continues the regional handcrafted traditions on his own. Mario specialises in turning unglazed fired biscuit earthenware, known in the region as “biscotto”. Another specialised artisan tends to the glazing, colouring and painting of the fired ceramic. Unglazed biscuit “biscotto” earthenware vases are hand-turned on a potter’s wheel following longstanding techniques particular to the city of Nova. No mould is used in the process. Unglazed biscuit “biscotto” earthenware vases are hand-turned on a potter’s wheel following longstanding techniques particular to the city of Nova. No mould is used in the process. 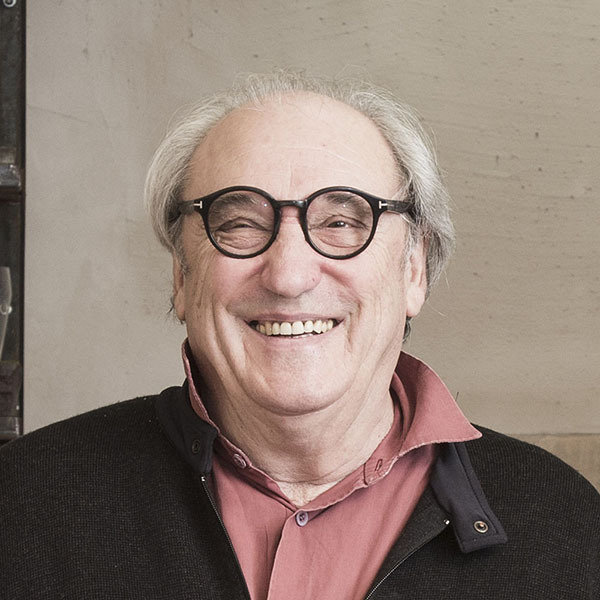 While Mario Bertolin’s grandfather and father worked clay with machines, Mario has dedicated the past 40 years to working exclusively by hand, continuing the rich ceramic traditions of the city of Nove, Vicenza. Mario, his brother Luigi and his uncle Severino co-founded Ceramiche Artistiche 3B in 1978. Mario’s brother and uncle have now retired so he continues the regional handcrafted traditions on his own. Mario specialises in turning unglazed fired biscuit earthenware, known in the region as “biscotto”. Another specialised artisan tends to the glazing, colouring and painting of the fired ceramic. Unglazed biscuit “biscotto” earthenware vases are hand-turned on a potter’s wheel following the longstanding techniques distinctive to the city of Nova. No mould is used in the process. Pepa Reverter graduated in printmaking from Escola Llotja in Barcelona, followed by a Bachelor's degree in sculpture at Barcelona University, Faculty of Fine Arts, and then a Master’s degree in video and TV production at the Universitat Politècnica. She now works from her studio in Poblenou, Barcelona’s art district. 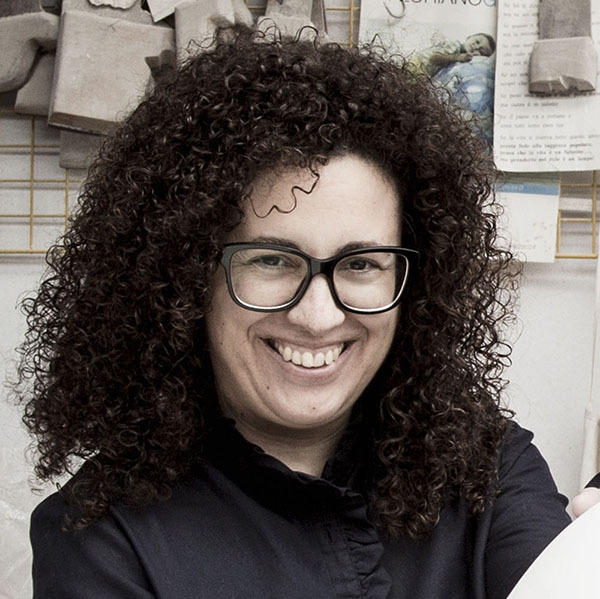 She loves working with clay, working on such projects as the design of the Sisters Collection of female heads in ceramics for the Italian company Bosa, and works with BD Barcelona. Shadows of Gold Gold leaf Hand beaten 24k gold leaf set on Bardiglio marble in rectangular patterns to create the image of rays of sunlight shining through a window onto table-top objects. The marble’s untouched grey surface represent the shadows. 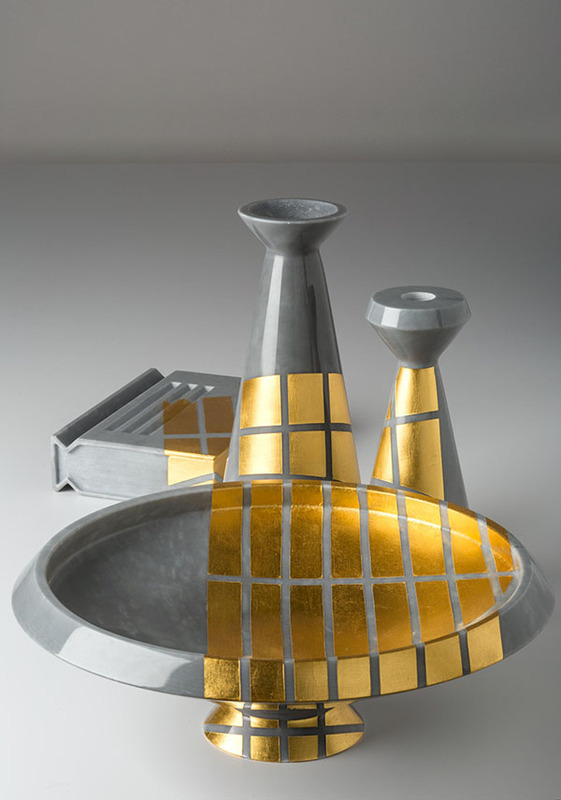 Shadows of Gold results from the collaboration between Dutch designer Kiki van Eijk and Italian gold leaf maker Marino Menegazzo of Mario Berta Battiloro. Kiki creates her design by making replicas of the windows in Marino’s family workshop and shining light through them onto a set of table-top objects. Marino beats gold by hand transforming gold ingots into micro thin gold foil. Using a special glue, a Venetian guilder then applies the gold leaf to the marble, the stone on which the gold leaf was beaten. Marino Menegazzo is one of the last artisans left in Europe able to turn an ingot into gold leaf by hand, an ancient profession that came to Venice from Byzantium in the 11th century. Marino works with his wife Sabina and their two daughters in the atelier Mario Berta Battiloro in Venice. Founded in 1969 by Sabina’s father, Mario Berta, the small workshop aims to continue the family trade started in 1926. In this historic artisanal laboratory, gold, silver and other precious metals are hammered into ultra-thin leaves, ready to be used in a number of fields. Marino rhythmically beats stacks of gold foil with a large hammer on a marble table that naturally cools the gold to the right temperature, creating fragile sheets of high quality gold leaf. Using an ancestral technique, Marino beats gold leaf by hand on top of a grey marble surface. Using an ancestral technique, Marino beats gold leaf by hand on top of a grey marble surface. Marino Menegazzo is one of the last artisans left in Europe able to turn an ingot into gold leaf by hand, an ancient profession that came to Venice from Byzantium in the 11th century. Marino works with his wife Sabina and their two daughters in the atelier Mario Berta Battiloro in Venice. Founded in 1969 by Sabina’s father, Mario Berta, the small workshop aims to continue the family trade started in 1926. In this historic artisanal laboratory, gold, silver and other precious metals are hammered into ultra-thin leaves, ready to be used in a number of fields. Marino rhythmically beats stacks of gold foil with a large hammer on a marble table that naturally cools the gold to the right temperature, creating fragile sheets of high quality gold leaf. Mario Berta Battiloro was founded in 1969 with the aim of continuing a family trade that began in 1926. The small atelier is run by Marino Menegazzo, one of the last artisans in Europe able to turn an ingot into gold leaf. Kiki van Eijk graduated from the Design Academy in Eindhoven, Netherlands, in 2000. 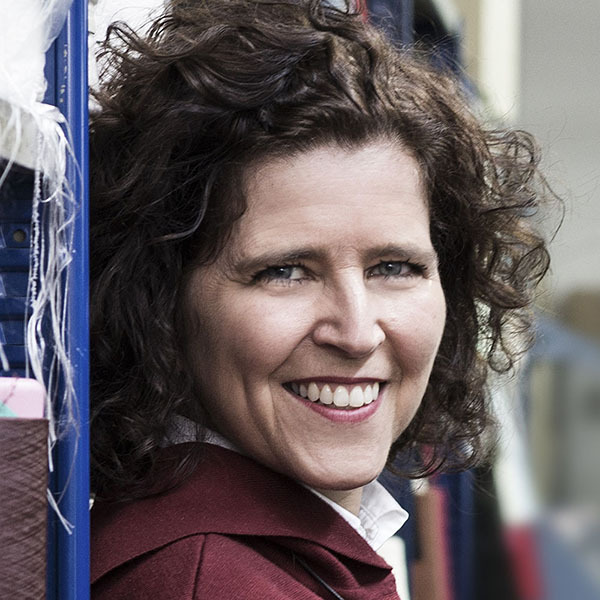 Kiki now works in Eindhoven with her husband Joost van Bleiswijk. She enjoys a mix of industry and craft-driven projects that originate in experiments she conducts using her hands, a process she calls “tinkering”. Her approach begins with a concept and is developed as a story, based on her fondness for narrative objects. In 2016, she was one of five designers including Alessandro Mendini to create new glass and wood surfaces for the Bisazza mosaic producer. 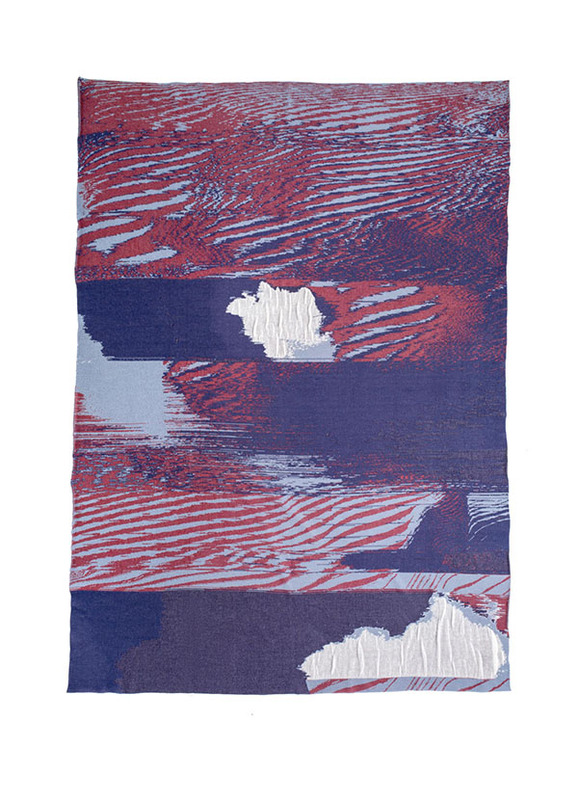 In 2017, two new rugs she designed for the Italian company Nodus were displayed at the TextielMuseum in Tilburg. 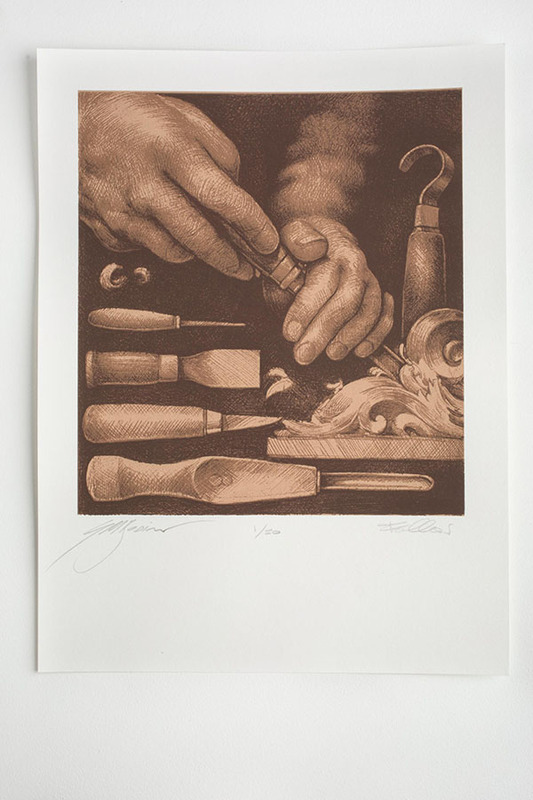 In praise of Hands Silk-screen print The five part screen-print series reproduces original ballpoint images of an artisan’s working hands. They portray five trades, each with their respective tools and objects being worked on, praising the role that manual skills play in the realisation of objects. In Praise of Hands results from an inspired collaboration between screen printer Gianpaolo Fallani and artist Giampiero Bodino. Using two differently sized black ink ballpoint pens Giampiero has created five original drawings of artisans' hands and their tools. Gianpaolo has then transposed two smaller versions of the originals with water-based ink to 250-gram Old Mill paper. One version has been finished using a brown shade of ink, the other with a grey shade of ink. In his early teenage years, Gianpaolo Fallani’s father Fiorenzo discovered different forms of printing in an old Florentine workshop. This early-born passion quickly became his career and following a move to Venice, Fiorenzo opened a screen-printing workshop in 1968. Gianpaolo now runs the screen-printing studio and shop. In 2012, when Gianpaolo was in charge of large format digital printing, he decided to go back to screen printing with his father. 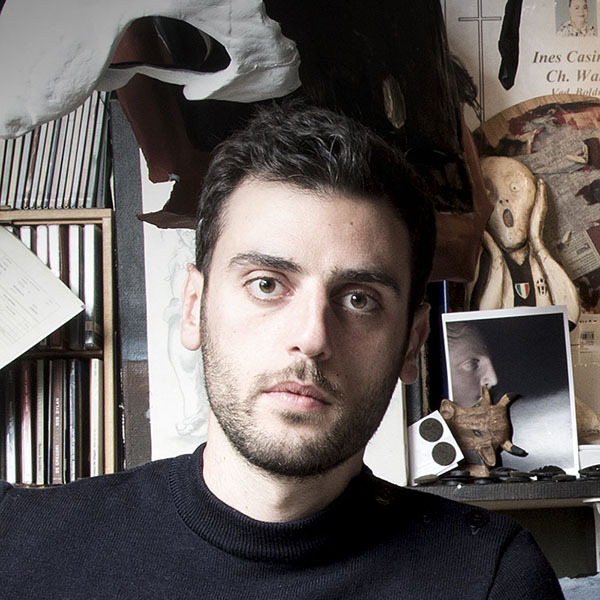 Gianpaolo has worked with many artists, organising residencies and workshops. The studio and shop is opened to the city through the hosting of numerous cultural events, concerts and exhibitions. Gianpaolo aims to keep the studio a vibrant place where artists can experiment and where the public can meet artists and see their work. The original is photographically transferred to a silk screen, blocking non-printing areas like a stencil. Ink is then wiped across the screen and ink that is not blocked transfers onto a substrate surface. The original is photographically transferred to a silk screen, blocking non-printing areas like a stencil. Ink is then wiped across the screen and ink that is not blocked transfers onto a substrate surface. In his early teenage years, Gianpaolo Fallani’s father Fiorenzo discovered different forms of printing in an old Florentine workshop. This early-born passion quickly became his career and following a move to Venice, Fiorenzo opened a screen-printing workshop in 1968. Gianpaolo now runs the screen-printing studio and shop. In 2012, when Gianpaolo was in charge of large format digital printing, he decided to go back to screen printing with his father. Gianpaolo has worked with many artists, organising residencies and workshops. The studio and shop is opened to the city through the hosting of numerous cultural events, concerts and exhibitions. Gianpaolo aims to keep the studio a vibrant place where artists can experiment and where the public can meet artists and see their work. Gianpaolo Fallani runs the artistic screen-printing studio founded by his father Fiorenzo in 1968, in Venice. When he joined the business, it specialised in photolithography, a process that transforms photographs and slides into typographically printed images. Since then, Gianpaolo has worked with many artists, organising residencies and workshops. Born in Turin, Giampiero Bodino first studied architecture. However, his career swerved toward design when he met automobile designer Giorgetto Giugiaro. After a stint designing cars himself, he moved to Rome to learn jewellery design with Gianni Bulgari. Ten years later, he met Franco Cologni and moved to Milan to open a design studio. Collaborations with Richemont brought him to work exclusively for the Swiss luxury group in 2000, becoming its art director in 2002. Since 2013, he has been designing high-end jewellery under his own name, making classically Italian, unique items with precious gems in unusual colour combinations. His studio and showroom are at the Villa Mozart in Milan. Italy Lido Lampworking Three painted lamps, two freestanding and one ceiling hung, evoke key images of Venetian life. 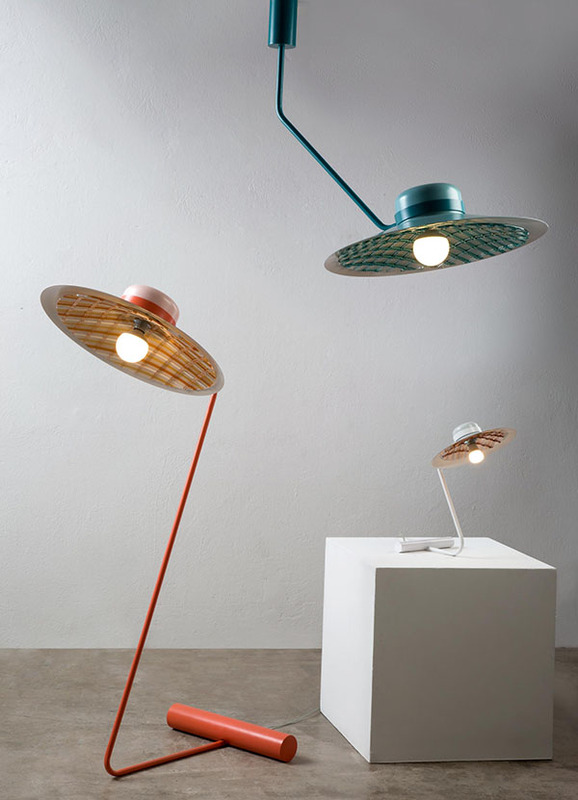 Lampshades conjure an image of straw hats worn at the Lido beach while the chequered pattern of the fused glass rods on the underside of the bare metal lamps recalls the patterns of Venice’s marble paved streets. Lido results from a collaboration between Serena Confalonieri and Francesca Merciari. Serena designed Lido intending to evoke key imagery of Venetian life, such as the curved metal stands that recall Venice’s canals, or the solid base that pays tribute to dry land. In order to effectuate the design, Francesca experiments with several techniques and creates the melted glass rod finish of the lampshades. Established in 1862, the Abate Zanetti School of Glass in Venice was relaunched in 2016 as a trade-based high school. The school, made up of glassworking masters, coordinates, creates and promotes training activities to teach glasswork. Murano glass rods are placed together in a chequered pattern then melted in a furnace. Disks are cut out and placed in a mould made from refractory ceramics. The result, a three-dimensional disk that is then fixed to the underside of the lamp. Murano glass rods are placed together in a chequered pattern then melted in a furnace. Disks are cut out and placed in a mould made from refractory ceramics. The result, a three-dimensional disk that is then fixed to the underside of the lamp. Established in 1862, the Abate Zanetti School of Glass in Venice was relaunched in 2016 as a trade-based high school. The school, made up of glassworking masters, coordinates, creates and promotes training activities to teach glasswork. Francesca Merciari graduated from the Accademia di Belle Arti di Ravenna. In 2003, while completing a two-year specialisation course in Bolzano, Francesca fell in love with glassmaking. In 2009, she moved to Venice, where she took a degree in visual and performing arts at the IUAV University. 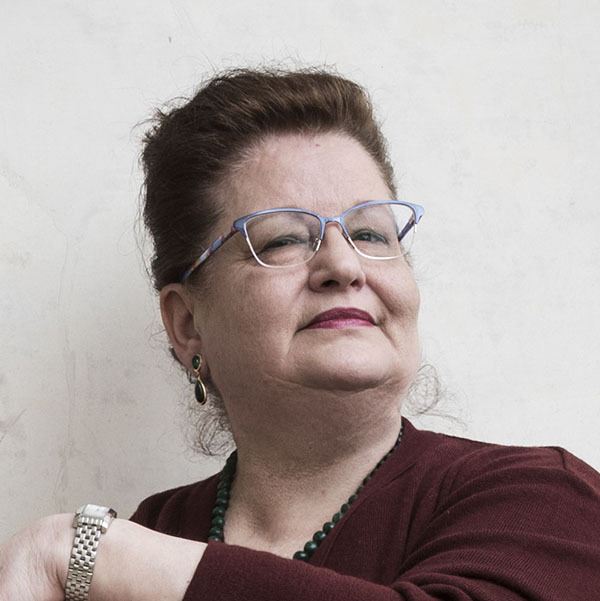 Thanks to her training in different glassworks in Murano, Merciari was able to integrate her historical and theoretical knowledge with practical and technical skills. 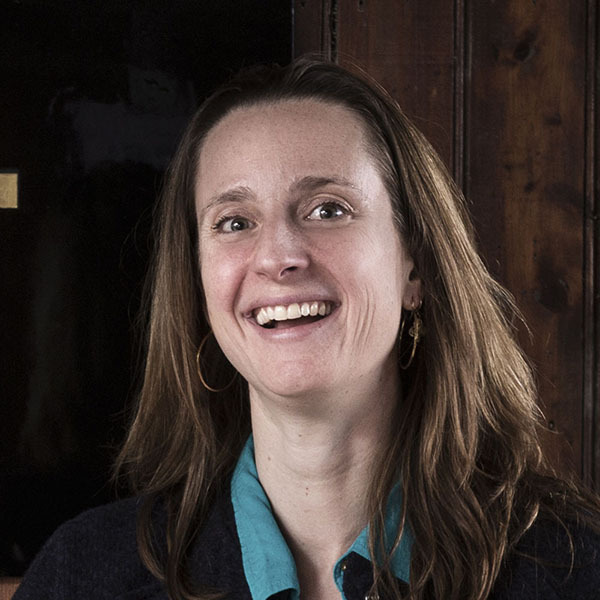 Since 2017, she has been teaching glass fusion and art history to teenagers at the Abate Zanetti School of Glass. 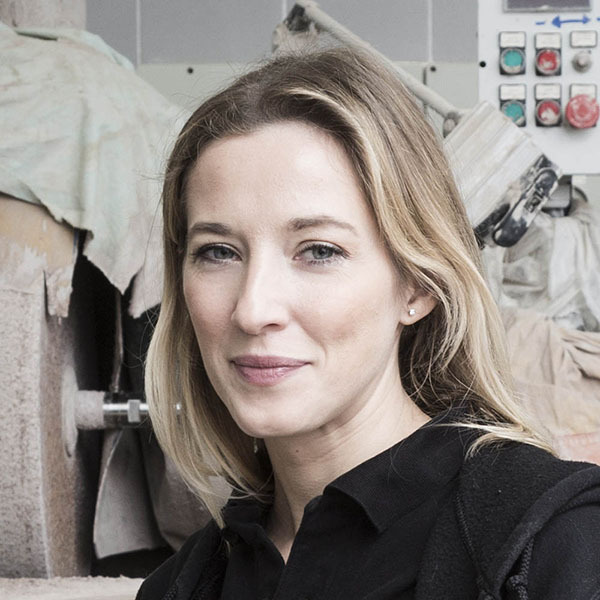 Serena Confalonieri graduated in interior design from the Milan Polytechnic in 2006. After working for architecture and design firms in Barcelona and Berlin, she opened her own studio in Milan in 2011. With a special interest in bold, textured surfaces, she creates products, graphics, textiles and interiors. 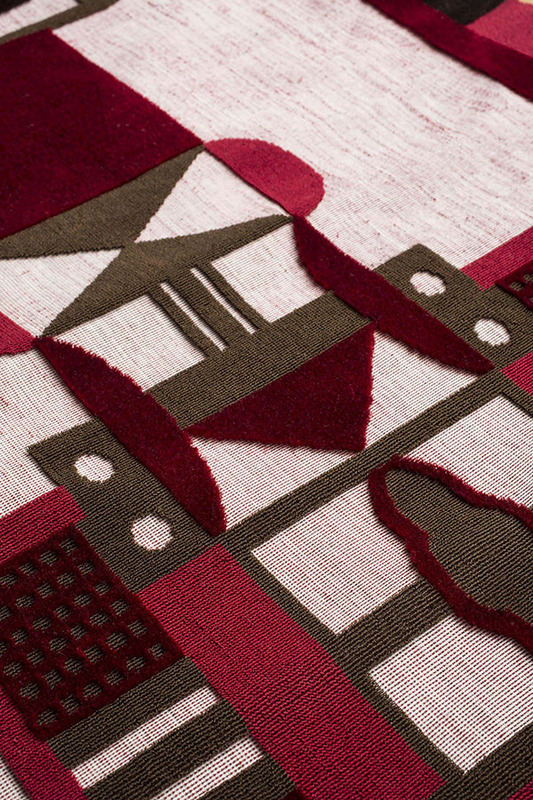 In 2016, thanks to a professional scholarship, she spent six months in New York working in a textile company as well as taking hand-weaving and rug-knotting classes. Her Masai collection of colourful ceramic vases with faux leather trim was presented at Fuorisalone in the Brera district during the 2017 Milan Salone del Mobile. Modular Type Typography Printed on two separate sheets of paper, this is a quasi-monotone series of combined geometric typefaces creating modular designs intended to question the link between art and communication. As such, in Module 1, an entire alphabet is created using a small number of geometric shapes. Modular Type results from the collaboration between typeface designer Erik Spiekermann and Silvio Antiga, the typographer in charge of Grafiche Antiga. Erik uses a design common in the 1920s. He has digitally designed three different sized typefaces then cut them out using a numerically-controlled machine. Bridging current day technologies and traditional typography, Silvio then places the typefaces on metal plates to print them through a manually operated printing press. The Tipoteca Italiana foundation was inaugurated in 1995 and a museum to promote and preserve the heritage of Italian typography opened its doors in 2002. The foundation also hosts educational workshops for schools, scholars and enthusiasts from around the world. Silvio Antiga’s passion for typography started at an early age. While the printing house rapidly developed so did new technologies. These swiftly supplanted traditional printing, casting aside the traditional printing press that that had first awakened Silvio’s passion. 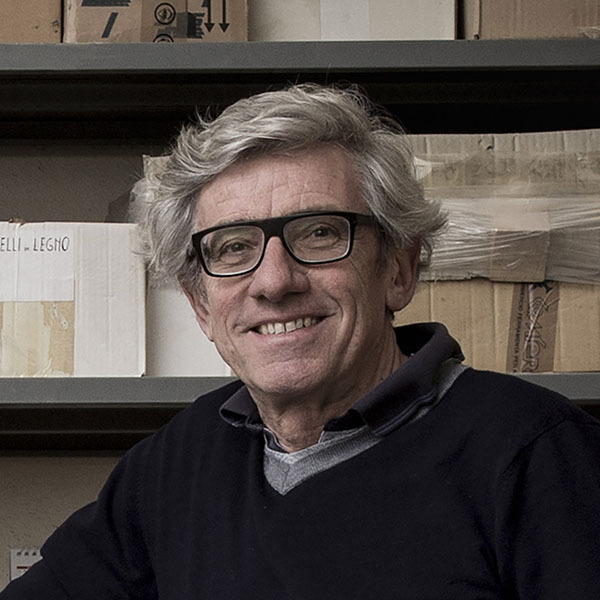 During the 1980s, the desire to preserve the characters of the early press motivated Silvio to collect artefacts related to traditional methods of printing and to immortalise them. Computer designed typefaces are cut out on maple and formica using a numerically controlled machine, the typefaces are then set on paper and passed through a hand operated printing press. Computer designed typefaces are cut out on maple and formica using a numerically controlled machine, the typefaces are then set on paper and passed through a hand operated printing press. The Tipoteca Italiana foundation was inaugurated in 1995 and a museum to promote and preserve the heritage of Italian typography opened its doors in 2002. The foundation also hosts educational workshops for schools, scholars and enthusiasts from around the world. Silvio Antiga’s passion for typography started at an early age. While the printing house rapidly developed so did new technologies. These swiftly supplanted traditional printing, casting aside the traditional printing press that that had first awakened Silvio’s passion. 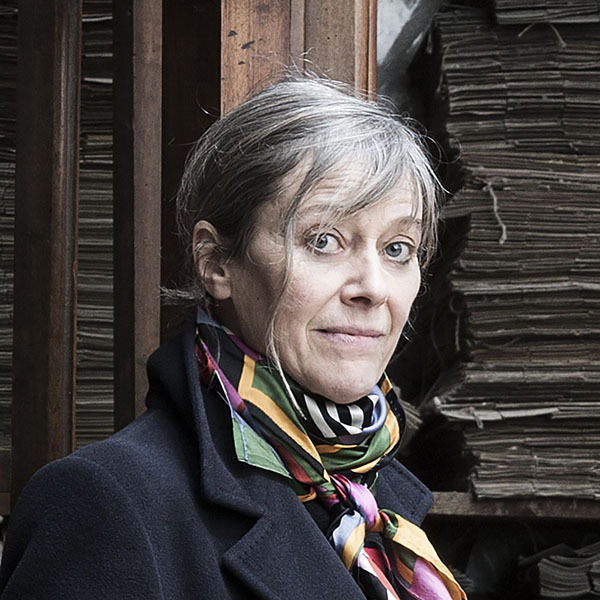 During the 1980s, the desire to preserve the characters of the early press motivated Silvio to collect artefacts related to traditional methods of printing and to immortalise them. 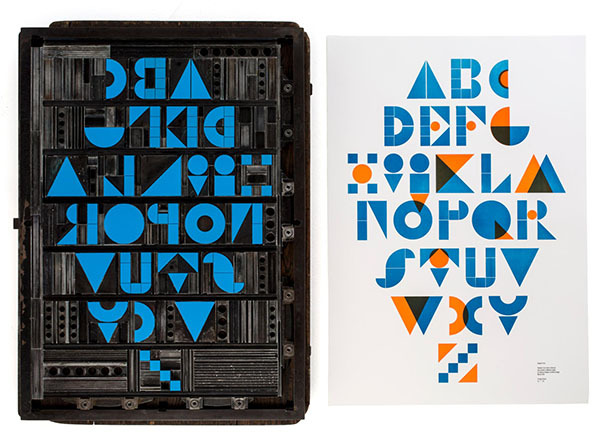 Computer-designed typefaces are cut out on maple and formica using a numerically-controlled machine, the typefaces are then set on paper and passed through a hand-operated printing press. A chance encounter with the trade kindled an early passion in Silvio Antiga for typography. Following an apprenticeship in a printing house in Montebelluna, Silvio opened Grafiche Antiga printing company in 1968. When change came to typography in the form of digital technology, Silvio remained fond of moveable type. He wrote and sent numerous letters throughout Italy in order to find and collect disused characters from attics and typographers. Then his fondness turned into a mission, and in 1995 he founded Tipoteca Italiana. Its 2,300 square metres feature a functioning print shop where visitors and schools can discover the art of letterpress. Exhibitions and talks held here revive the knowledge of printing and make it pertinent to contemporary times. 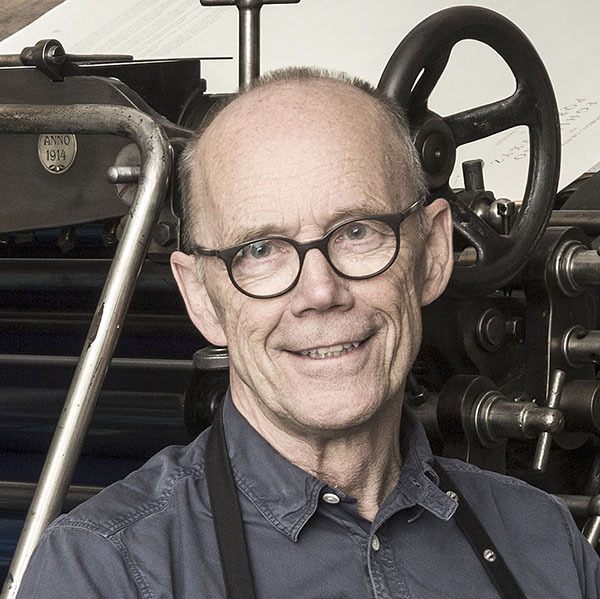 Erik Spiekermann is a German printer, type designer and writer. He runs p98a, an experimental gallery and letterpress shop in Berlin. Two of his typefaces, FF Meta and ITC Officina, are considered modern classics. He is an honorary professor at the University of the Arts Bremen and the ArtCenter College of Design in Pasadena, California. In 2007 he was elected a Royal Designer for Industry by the British Royal Society of Arts. 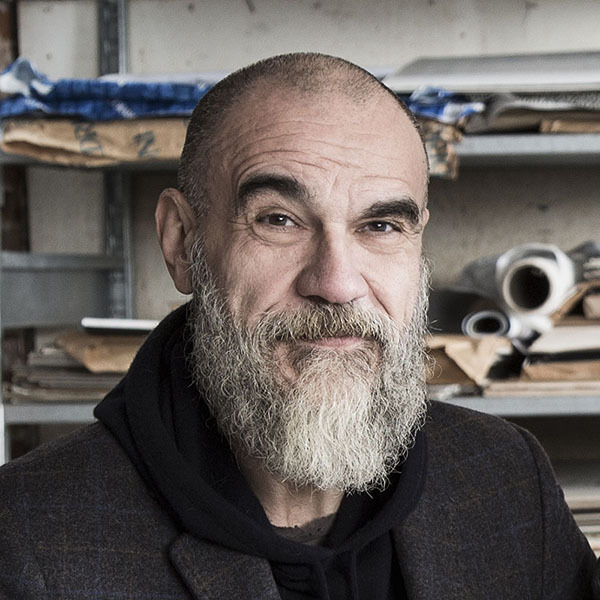 In 2011, he received the German National Design Award for Lifetime Achievement. 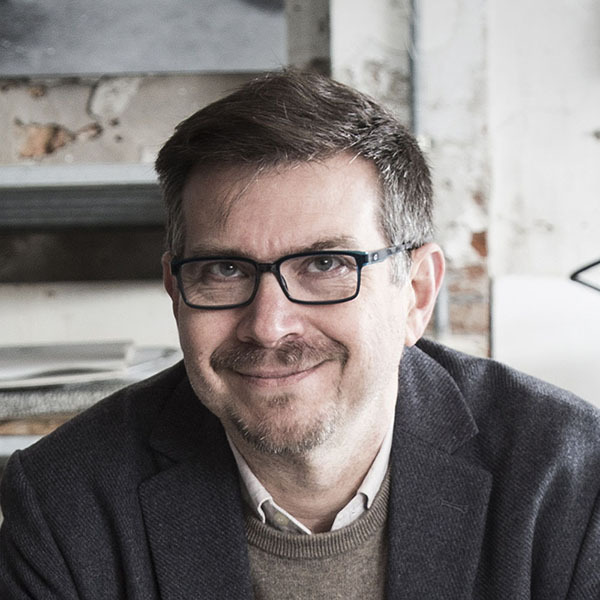 He has written books about typography and has had a column in Blueprint magazine since 2008. Hello I am Erik, about his life and work, was published in 2014. Typographic modules Typography The typographic modules display different elements essential to the work of the typesetter, such as the varied point size of typeface shapes, line length, line spacing and letter spacing. 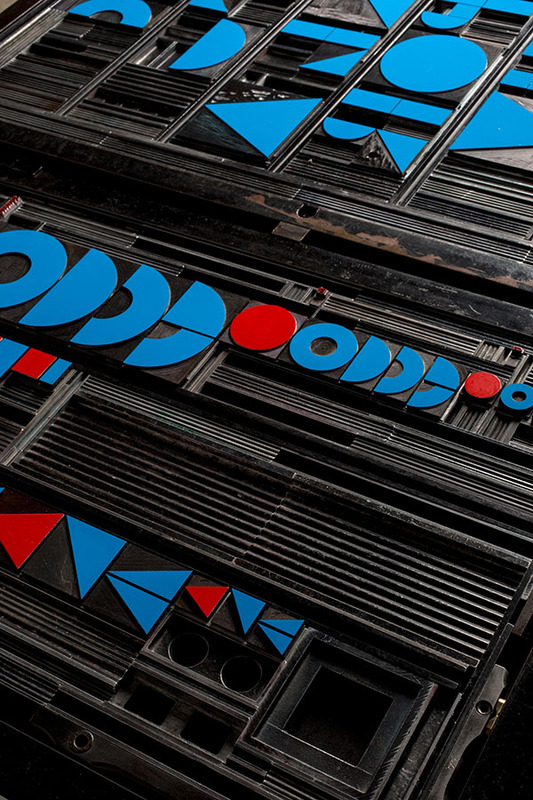 The monotone blue or red typefaces are set on a metal structure created to accommodate and move them around easily. Fundamentals Metal sculpture Three brushed silver condiment-dispensers are reminiscent of the fundamental forms of classical architecture: a column, an arch and bricks. Set on two silver plates, placed on six circular legs, these three objects evoke the architectural depictions of early Renaissance painters. A long silver teaspoon is set alongside the dispensers. Fundamentals result from a collaboration between designers Azusa Murakami and Alexander Groves of Studio Swine and goldsmith Giampaolo Babetto. Giampaolo has never worked with a designer before and designing in silver is a first for Studio Swine. The design duo drew their inspiration from the classically built city of Padua. Giampaolo constructs the contemporary objects using traditional techniques and materials, intending to bring out the fundamental purity of form. 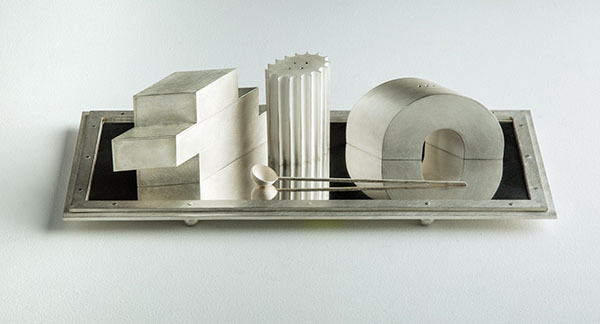 Using traditional techniques, Giampaolo constructs the objects by hand, solving new challenges generated by the complexity of the apparently simple design, such as the use of metal rods to hammer the curved shapes of the silver columns. Super Wide Interdisciplinary New Explorers (aka Studio Swine) is a collaboration between the Japanese architect Azusa Murakami and the British artist Alexander Groves, a couple who explore regional identity and the future of resources in their work. Studio Swine’s films have been awarded at Cannes and other film festivals, and its work exhibited at the Victoria and Albert Museum in London, Centre Pompidou in Paris and the Venice Art Biennale. In 2017, the installation New Springs was shown in Milan (where it won a Salone award for engagement) and in Miami as an interactive feature for visitors: an artificial tree blossoming with scented, mist-filled bubbles. Using traditional techniques, Giampaolo constructs the objects by hand, solving new challenges generated by the complexity of the apparently simple design, such as the use of metal rods to hammer the curved shapes of the silver columns. 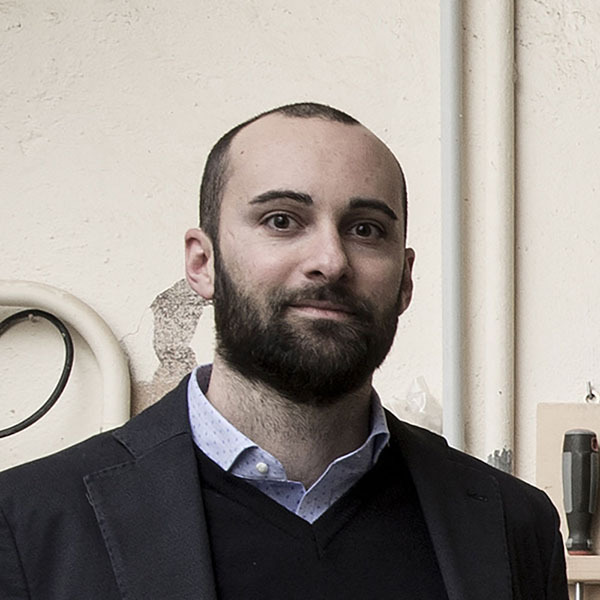 Giampaolo constructs the objects using traditional techniques. He must solve new challenges generated by the complexity of the apparently simple design, such as using metal rods to hammer the curved shapes of the silver columns. Master goldsmith Giampaolo Babetto studied at the Pietro Selvatico Art Institute in Padua and then at the Academy of Belles Artes in Venice. Giampaolo began working as a goldsmith and experimenting with metal arts in 1969. Since then he has exhibited his jewellery and metalwork internationally. Giampaolo does not wish to reflect outward appearances through his work but rather the inwardness or essence of objects. This has driven him to work with geometric forms, creating works that reflect a minimalist, architectural to figurative range of styles. To achieve distinctive colours and delicate textures, he personally prepares a metal alloy of his creation. He textures the surfaces by beating and often scratching the gold. He has taught in many international art schools. 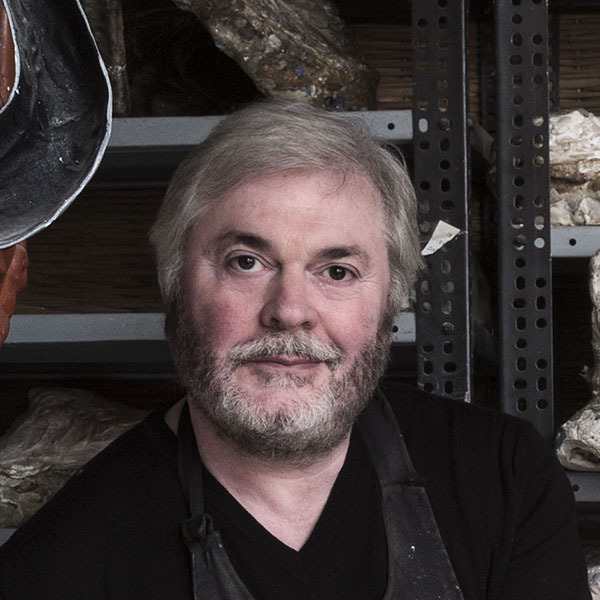 His work has been exhibited around the world and features in the collections of the Pforzheim Jewellery Museum in Germany and the Victoria and Albert Museum in London. Babetto explores a modernistic aesthetic. Super Wide Interdisciplinary New Explorers (aka Studio Swine) is a collaboration between the Japanese architect Azusa Murakami and the British artist Alexander Groves, a couple who explore regional identity and the future of resources in their work. Studio Swine’s films have been awarded at Cannes and other film festivals, and its work exhibited at the Victoria and Albert Museum in London, Centre Pompidou in Paris and the Venice Art Biennale. In 2017, the installation New Springs was shown in Milan (where it won a Salone award for engagement) and in Miami as an interactive feature for visitors: an artificial tree blossoming with scented, mist-filled bubbles. Cabinet 82 Furniture The brown mahogany and light yellow oak veneer of Cabinet 82 has been completely handmade using traditional techniques. 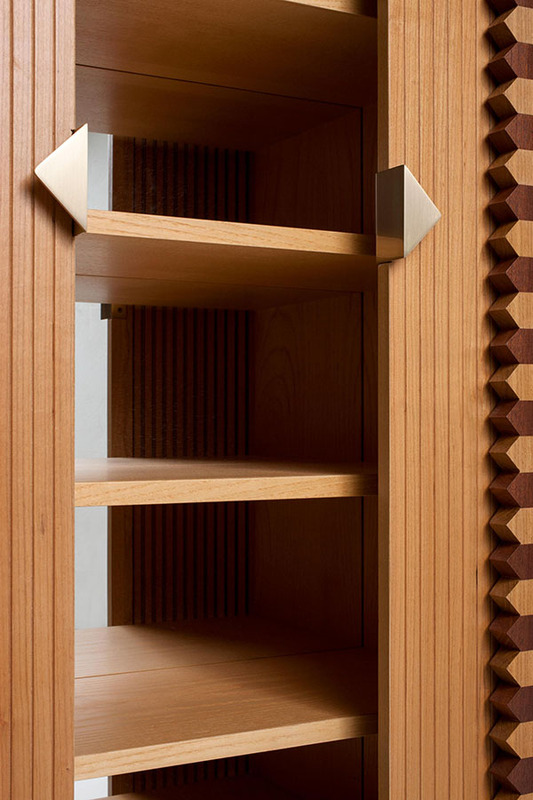 Only two triangular metal handles on the cherry-veneered sliding cabinet doors interrupt the otherwise completely wooden cabinet. Cabinet 82 was born from the collaboration between two duos, Lebanese designers David Raffoul and Nicolas Moussallem and Italian cabinetmakers Giorgio and Alessandro Morelato. Inspired by their home countries, the design of Cabinet 82 is evocative of 12th century Lebanon while also embracing contemporary Mediterranean design. Giorgio and Alessandro worked the entire piece by hand, painstakingly joining the 82 solid strips of alternating oak and mahogany to the curved plywood. Giorgio Morelato is a master cabinetmaker and lends his name to the family workshop and company that crafts home furniture. Alessandro Morelato, Giorgio’s son, works alongside his father. Giorgio and Alessandro produced Cabinet 82 using techniques inherent to the rich traditions of cabinetmaking. However, the workshop is no stranger to modern techniques and they enjoy merging ancient and modern practices. By combining time-honoured knowledge and classical styles such as Biedermeir and Louis XVI with contemporary modular designs, the workshop remains attached to local traditions while appealing to contemporary tastes. As well as designing their own furniture, the studio also works with internationally acclaimed designers. Giorgio Morelato is the president of the woodcraft-promoting Aldo Morelato Foundation, housed in Villa Dionisi, Verona. Handmade cabinet using traditional methods, assembled with dowels, dry joints and glue. Curved plywood with dry-joined triangles of oak and mahogany strips make up the exterior. The top and base are crafted from solid ash. Handmade cabinet using traditional methods, assembled with dowels, dry joints and glue. Curved plywood with dry-joined triangles of oak and mahogany strips make up the exterior. The top and base are crafted from solid ash. 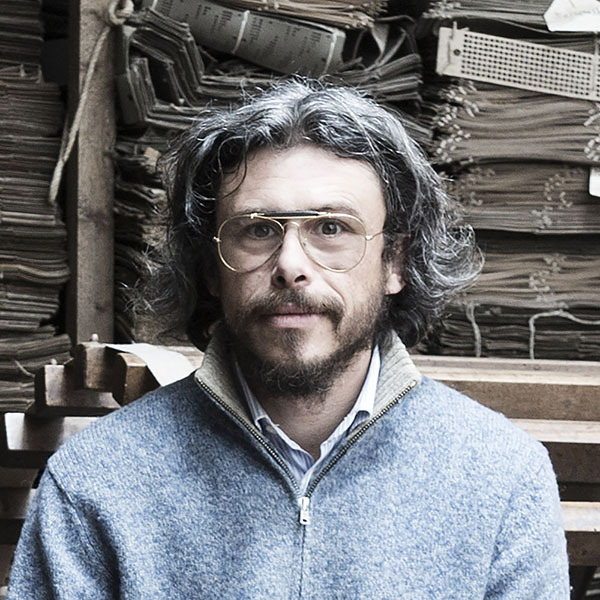 Giorgio Morelato is a master cabinetmaker and lends his name to the family workshop and company that crafts home furniture. Alessandro Morelato, Giorgio’s son, works alongside his father. Giorgio and Alessandro produced Cabinet 82 using techniques inherent to the rich traditions of cabinetmaking. However, the workshop is no stranger to modern techniques and they enjoy merging ancient and modern practices. By combining time-honoured knowledge and classical styles such as Biedermeir and Louis XVI with contemporary modular designs, the workshop remains attached to local traditions while appealing to contemporary tastes. As well as designing their own furniture, the studio also works with internationally acclaimed designers. 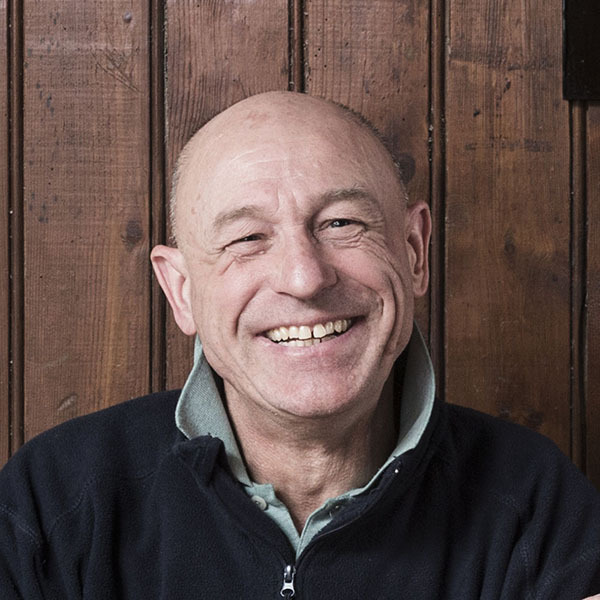 Giorgio Morelato is the president of the woodcraft-promoting Aldo Morelato Foundation, housed in Villa Dionisi, Verona. Master cabinetmaker Giorgio Morelato lends his name to the family company specialised in perfectly crafted furniture. While the Morelatos are attached to local traditions they are also eager to appeal to contemporary tastes. Giorgio Morelato is the president of the woodcraft-promoting Aldo Morelato Foundation, housed in the stunning Villa Dionisi. David Raffoul and Nicolas Moussallem met and studied design at the Académie Libanaise des Beaux-Arts, and set up david/nicolas in Beirut in 2011. The duo’s retro-futuristic aesthetic combines geometry, antique furniture and mechanics, creating furniture both antique and contemporary in design. In 2014, The New York Times named them one of three breakout stars of the Milan Salone del Mobile. In 2015, Nilufar gallery in Milan started to feature their tables, chairs and sofas. The duo are represented by Carpenters Workshop Gallery in Paris, which exhibits their limited-edition pieces. In 2018, their marble Triangoli vases received the Wallpaper* Design Award. Nebbia Collection (Fog collection) Blown Glass Inspired by the misty landscapes of London and Venice, this set of six hand-blown glasses, carafe and tray comprises an impressive number of Murano glass-making techniques. 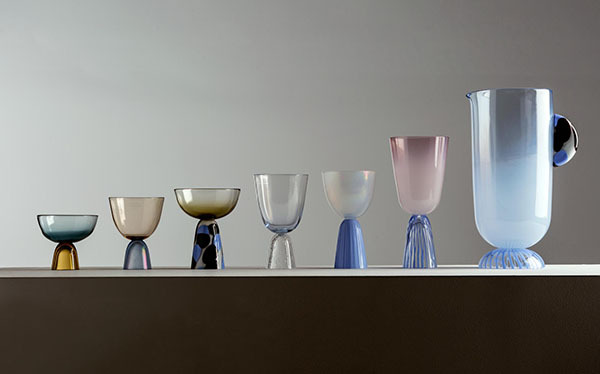 While each goblet has the same base, all have been cut to different sizes and finished in different colours. Nebbia Collection is the result of a colourful collaboration between designers Laetitia De Allegri and Matteo Fogale and glassworker Andrea Zilio of Anfora. Laetitia and Matteo have designed a collection based on Anfora’s early history of stemware, drawing their inspiration from foggy landscapes. Through the execution of the design, Andrea demonstrates his mastery of a wide-range of glasswork techniques. Born in Venice, Andrea Zilio joined Anfora glassworks at the age of 19. The workshop on the island of Serenella, Murano, is now run by his brother-in-law Renzo Ferro. Renzo’s father Giulio taught Andrea the craft and kindled an early passion for replicating historical works of blown-glass. As a member of Anfora, Andrea has blown glass for both artists and designers, including Yoichi Ohira, Ritsue Mishima and Emmanuel Babled. Hand-blown into the same wooden mould, each glass has the same base. However, no two are identical having all been cut at different heights, altering their proportions. By blowing white glass over transparent glass a hazy shade is created. Hand-blown into the same wooden mould, each glass has the same base. However, no two are identical having all been cut at different heights, altering their proportions. By blowing white glass over transparent glass a hazy shade is created. Born in Venice, Andrea Zilio joined Anfora glassworks at the age of 19. The workshop on the island of Serenella, Murano, is now run by his brother-in-law Renzo Ferro. Renzo’s father Giulio taught Andrea the craft and kindled an early passion for replicating historical works of blown-glass. As a member of Anfora, Andrea has blown glass for both artists and designers, including Yoichi Ohira, Ritsue Mishima and Emmanuel Babled. Hand-blown into the same wooden mould, each glass has the same base. However, no two are identical, having all been cut at different heights, altering their proportions. By blowing white glass over transparent glass a hazy shade is created. Venetian-born Andrea Zilio joined the Anfora glassworks on the island of Serenella (Murano) when he was 19. His brother-in-law Renzo Ferro’s father Giulio taught Andrea the craft. Andrea’s taste for replicating historical blown-glass vessels enabled him to gradually create objects of his own design, for which he mastered the most complex traditional techniques, including reticello, incalmo, zanfirico and sommerso. Mastering traditional techniques provided Andrea with the knowhow to create innovative contemporary objects of his own design based on a rich glassblowing heritage. 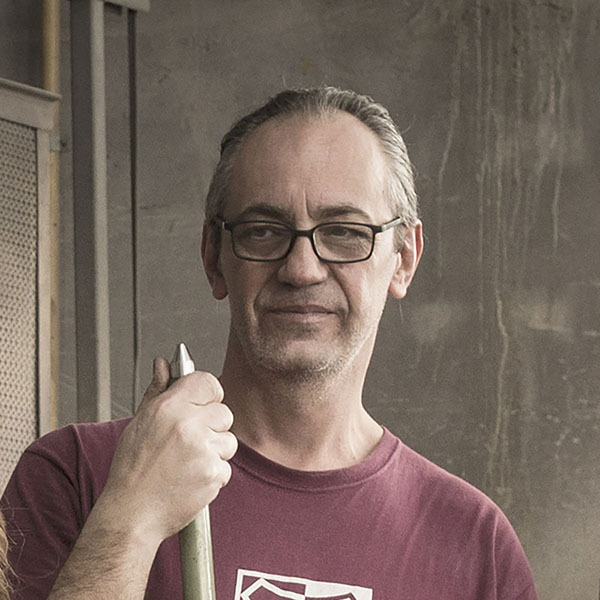 Quickly, Andrea’s passion for this craft led him to obtain the status of primo maestro (first teacher) at the Glass School Abate Zanetti, in Murano. Andrea taught at the Pilchuck Glass School in Seattle, Washington and was a member of the Abate Zanetti School of Glass in Murano. Swiss-born Laetitia de Allegri and Uruguayan-born Matteo Fogale met in 2010 while working at Barber & Osgerby in London, the city in which they would jointly open their studio. 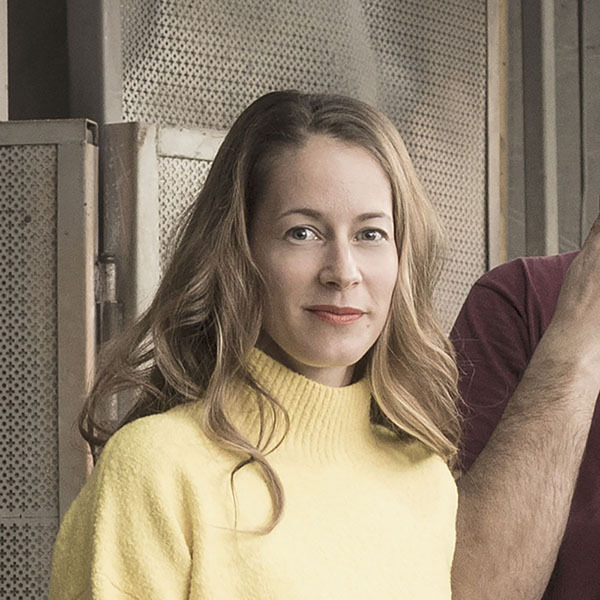 Laetitia and Matteo like to combine industry and craftsmanship using honest, unconventional materials that promote functionality and longevity. In 2014, their “Ish” collection of furniture made out of reclaimed post-industrial waste was awarded a Wallpaper* Design Award. In 2017, they presented the Nereidi collection of glass vases hand-blown by Salviati. The same year, their mausoleum of Giallo di Siena and Noir Doré marble for the Tuscan stone company Casone was shown in the Brera district during the Milan Salone del Mobile. 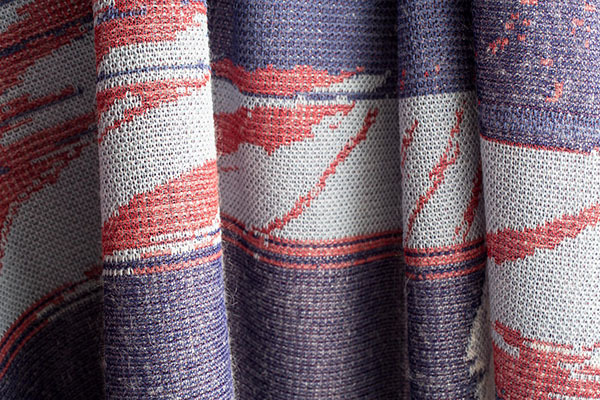 Dreamscape _ Doppia Firma Knitted textiles Two pieces of separately framed textiles form a design intended to recreate a dreamlike landscape. The uneven surface of the seemingly two-dimensional textiles is composed of various overlaid hand-stitched fragments to create a three-dimensional pastel coloured fabric. Dreamscape is the result of a creative collaboration between Ini Archibong and Elisabetta Bocchese of Maglificio Miles for Doppia Firma 2018. While Ini creates the designs and visualises the texture and surface of the textile fabrics, Elisabetta’s profound knowledge of knitwear brings these designs and visions to life through close coordination of an expert team of skilled artisans. Silvia Stein Bocchese and her husband founded Maglificio Miles, a high-quality knitwear producer, in 1962. Silvia remains the president, but her four children now run the family company as a team. Silvia’s daughter Elisabetta Bocchese is in charge of creative operations. Using her profound knowledge of knitwear, Elisabetta makes sure that designers' ideas are finished to the highest possible standards by an expert team of artisans with wide-ranging skills. The company collaborates with some of the best names in fashion, including Azzedine Alaïa with whom it has worked for nearly 40 years. For Dreamscape, jacquard and fur stitches are made on digitally controlled knitting machines using complex algorithms, resulting in an innovative design hand-finished by master artisans. The embossed effect of Nebula is created using the tubular technique. Specialised pattern makers and skilled tailors modelled and tailored the garment’s shape, linked the pieces together and sewed the finishing touches stitch by stitch. For Dreamscape, jacquard and fur stitches are made on digitally controlled knitting machines using complex algorithms, resulting in an innovative design hand-finished by master artisans. The embossed effect of Nebula is created using the tubular technique. Specialised pattern makers and skilled tailors modelled and tailored the garment’s shape, linked the pieces together and sewed the finishing touches stitch by stitch. Silvia Stein Bocchese and her husband founded Maglificio Miles, a high-quality knitwear producer, in 1962. Silvia remains the president, but her four children now run the family company as a team. Silvia’s daughter Elisabetta Bocchese is in charge of creative operations. Using her profound knowledge of knitwear, Elisabetta makes sure that designers' ideas are finished to the highest possible standards by an expert team of artisans with wide-ranging skills. The company collaborates with some of the best names in fashion, including Azzedine Alaïa with whom it has worked for nearly 40 years. For Dreamscape, jacquard and fur stitches are made on digitally controlled knitting machines using complex algorithms, resulting in an innovative design hand-finished by master artisans. Elisabetta Bocchese is in charge of creative operations at Maglificio Miles, a high-quality knitwear producer founded by her parents in 1962. 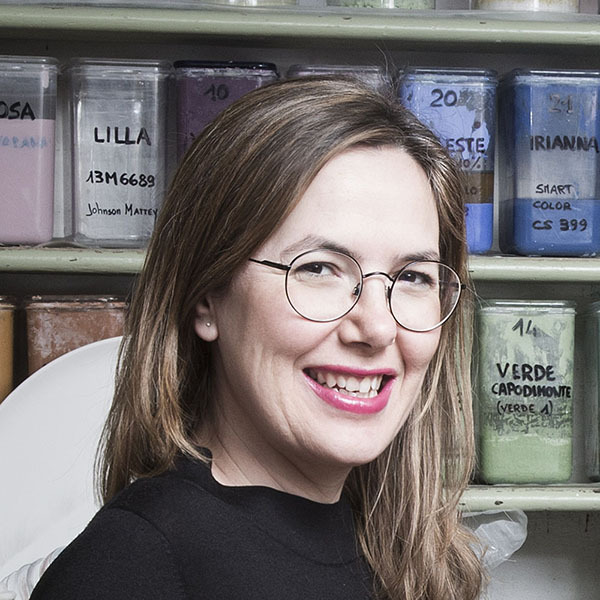 Elisabetta makes sure that fashion designers’ ideas are executed to the highest possible standard, a task that combines specialised pattern makers, skilled tailors who work by hand, and digital programmers of advanced knitting machines. 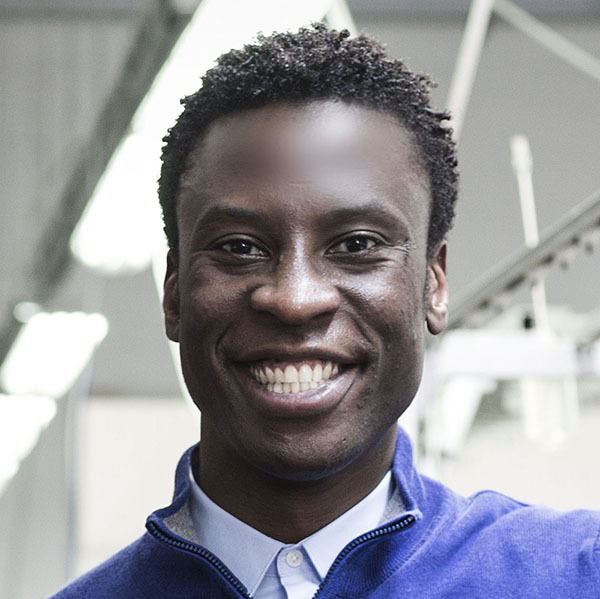 The American designer Ini Archibong recently graduated from the École Cantonal d’Art Lausanne Master’s degree in Design for Luxury and Craftsmanship. In Switzerland, he discovered traditional crafts, attention to detail and skills in luxury-goods production. This, together with the Swiss way of life, prompted him to settle in Neuchâtel, where he works independently. His interests include architecture, engineering, environmental and product design as well as mathematics, philosophy and world religions. Nebula_ Doppia Firma Knitted textiles Six ochre and earth coloured lamps hang down unevenly from twisted ceiling hung cables. An almost invisible ceramic structure covered by an uneven textile fabric lends a sand or rocklike texture to the lamps. The design intends to recreate a miniature stellar universe. Bandiera Per un Giorno (Flag for a Day) _ Doppia Firma Woven fabrics Inspired by the Serenissima flag, this symmetrically designed rectangular shaped tapestry is set on a red and white cotton monochrome background. The design is mirrored vertically down the centre of the tapestry. Combined cut and uncut red-brown and black patterns create a raised surface (pile) on the velvet fabric. Bandiera Per un Giorno (flag for a day) results from the collaboration between Italian weaver Emanuele Bevilacqua of Tessitura Luigi Belilacqua and French painter-designer Nathalie du Pasquier. Nathalie first draws the design, inspired by the flag of the Republic of Venice - known as the Serenissima flag (most serene Republic of Venice) - with pencil on paper, and then verifies the proportion by enlarging it to its full scale. Emanuele and Nathalie then choose the colours for the design together. Finally, using centuries-old looms, Emanuele creates the design by hand. Emanuele Bevilacqua grew up in a family that has woven velvets, silks and damasks in its own mill for centuries. His ancestor Luigi Bevilacqua first created Tessitura Luigi Belilacqua in 1875. At the time, Luigi acquired the 18th century weaving looms from a silk-weaving school in Venice. The same machines are used in the mill to this day, though with 21st century punched cards and replacement parts taken from other machines. Following a complex mathematical process, weaving patterns are transferred to a series of perforated cartoons, before the work is then executed and cut manually by a team of expert weavers in the mill. At Tessitura Luigi Bevilacqua, Emanuele creates classical designs for fabrics used in interior decoration, designs usually taken from the company’s 3,500-piece archive. Using Jacquard looms, weavers cut each millimetre of the fabric by hand. The intricacy of the woven process means that only 30 to 80 centimetres of velvet can be woven per day. Using Jacquard looms, weavers cut each millimetre of the fabric by hand. The intricacy of the woven process means that only 30 to 80 centimetres of velvet can be woven per day. Emanuele Bevilacqua grew up in a family that has woven velvets, silks and damasks in its own mill for centuries. His ancestor Luigi Bevilacqua first created Tessitura Luigi Belilacqua in 1875. At the time, Luigi acquired the 18th century weaving looms from a silk-weaving school in Venice. The same machines are used in the mill to this day, though with 21st century punched cards and replacement parts taken from other machines. Following a complex mathematical process, weaving patterns are transferred to a series of perforated cartoons, before the work is then executed and cut manually by a team of expert weavers in the mill. At Tessitura Luigi Bevilacqua, Emanuele creates classical designs for fabrics used in interior decoration, designs usually taken from the company’s 3,500-piece archive. Weavers work on Jacquard looms, cutting each millimetre of the fabric by hand. The intricacy of the weaving process means that only 30 to 80 centimetres of velvet can be woven per day. After high school, Emanuele Bevilacqua worked for a while as an architectural draftsman. However, since he grew up in a family that has been weaving brocades, velvets and damasks for three centuries, it was not long before he followed the family tradition. Emanuele creates classical designs for fabrics used in interior decoration. Following a complex mathematical process, he makes perforated cartoons of the weaving patterns. Inspiration comes naturally, given his familiarity with the company’s 3,500-piece archive. Nathalie Du Pasquier was born in Bordeaux and has lived in Milan since 1979. Until 1986, she worked as a designer and was a founding member of Memphis, the design group united by Ettore Sottsass. She designed decorated surfaces: textiles, carpets, plastic laminates, as well as some furniture. In 1987, she started to dedicate herself to painting. Nathalie paints still life and geometric abstracts with flat colours. She also builds and paints furniture-size structures that are sometimes walk-in rooms. Five monographs of her work have been published, the most recent of which is From Some Paintings, conceived and designed by Nathalie for the exhibition held at La Loge in Brussels in 2017. 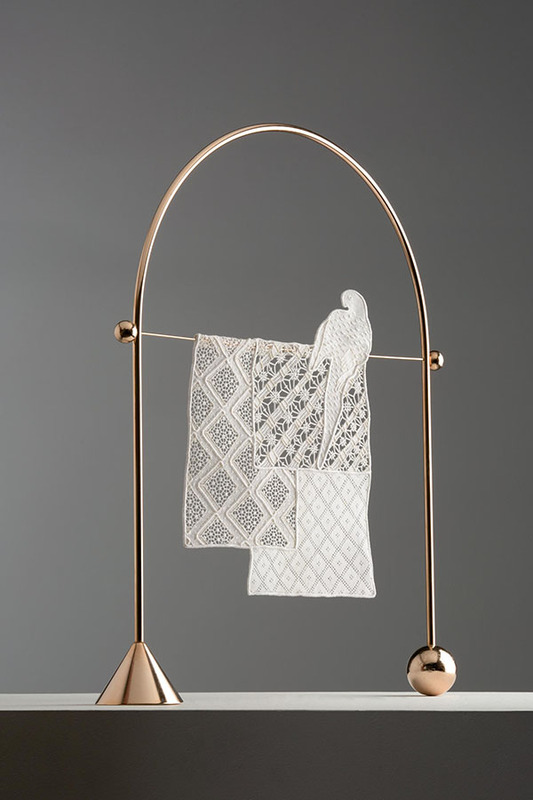 Birds, Diamonds and Stripes Crochet embroidery A “ricci d’angelo” and “Venezia” needlepoint-made parrot is perched on a brass bar that hangs suspended between the vertical supports of a brass arch. The pattern and motif of the work are evocative of laundry hanging from windows over Venice’s narrow streets. Birds, Diamonds and Stripes is the result of a collaboration between Italian lace artisan Lucia Constantini and designer India Mahdavi. India’s design blends styles taken from her past projects and draws inspiration from everyday Italian life, such as clothes hung between city buildings to dry. Using her knowledge and experience, Lucia stitches the intricate design by hand, bringing together age-old stitching techniques as well as her own innovative methods. In order to hand-sew the needle stiches that make up the detailed lace patterns, Lucia first makes a line drawing of the design. Lucia layers this with paper and uses a Singer Treadle Sewing Machine to sew the outline of the design. In order to hand-sew the needle stitches that make up the detailed lace patterns, Lucia first makes a line drawing of the design. She layers this with paper and uses a Singer Treadle Sewing Machine to sew the outline of the design. Lucia Costantini was born into a world of merletto lacemaking in Burano. Practised by women in her family and neighbourhood as a passion rather than profession, she grew up immersed in this craft. The neighbourhood would convene in small Venetian piazzas to work on lace together. Aged 11, Lucia started to attend a lace school run by nuns after which she followed a Veneto region training course. Passionate about innovation, Lucia goes beyond the traditional limits of lacemaking by combining traditional lacework patterns and techniques with her own pioneering methods, experimenting with materials beyond white cotton such as metal or polychrome fabrics. Lucia has taught in Italy and throughout the world and has been the recipient of multiple prizes both in Italy and abroad. 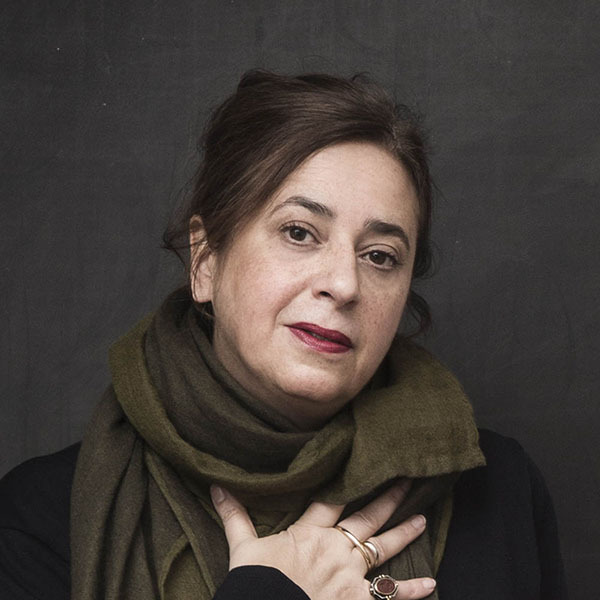 Architect and designer India Mahdavi is based in Paris. 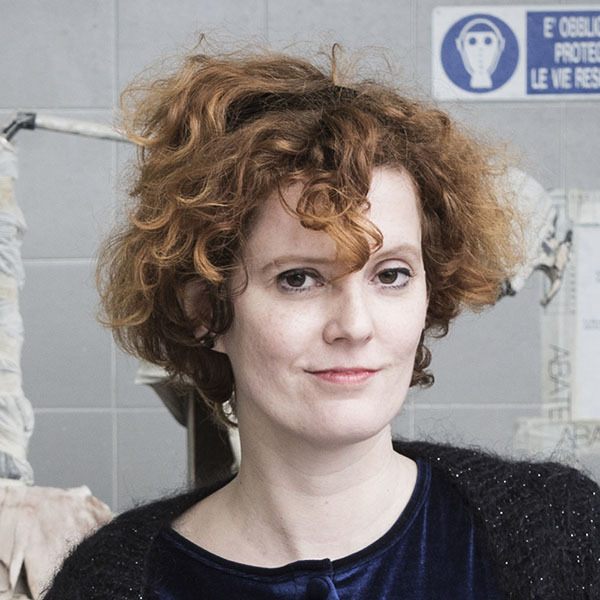 Her studio, created in 2000, is known for the diversity of its international projects that explore the fields of architecture, interior design, scenography, furniture and object design. India has created a unique environment combining a modern sense of comfort and elegance with colour and humour, a cross-cultured art de vivre. India was appointed Officier des Arts et des Lettres by the French government in 2015. 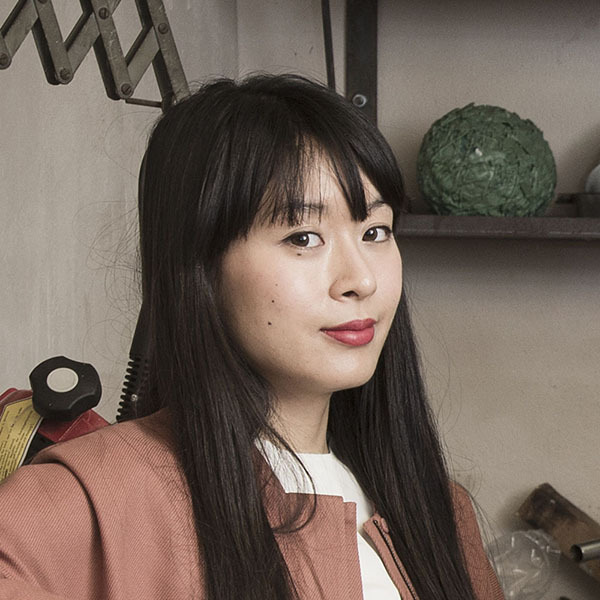 In 2014, 2017 and 2018, she featured on the AD100 list of talents compiled by Architectural Digest. Another Nature Ceramic vessel Another Nature comprises works inspired by the company's proud heritage. 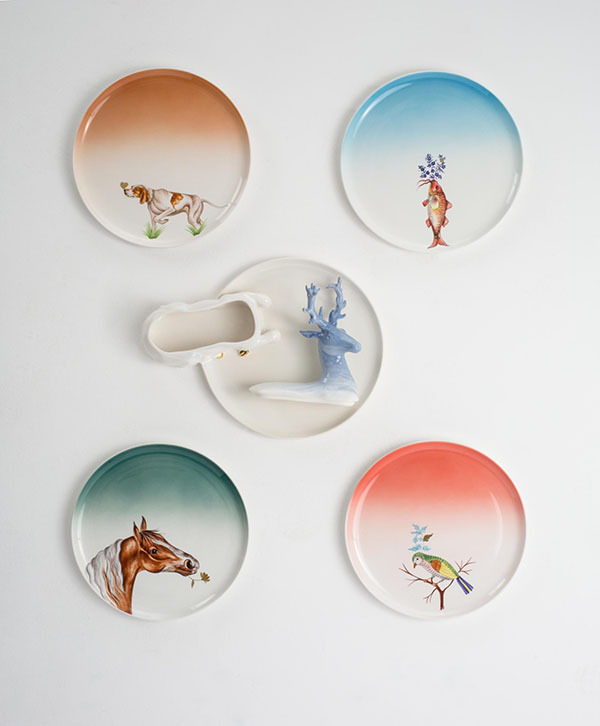 Five animal motifs taken from Este Ceramiche Porcellane’s rich archives decorate four handmade porcelain plates and a tray. These variations of traditional motifs are hand-painted and hand-sprayed. Another Nature is the result of a creative collaboration between Giovanni B. Fadigati of Este Ceramiche Porcellane and designer Inma Bermúdez. Through an exploration of Este’s archives, Inma captures the essence of past motifs and reworks them using contemporary design tools. Giovanni then oversees the entirely handmade production of the porcelain. The result is a product that combines traditional techniques with innovation. First established in the 18th century, Este Ceramiche Porcellane is one of the oldest porcelain manufacturers in Europe. Giovanni Battista Fadigati's father bought the iconic factory in 1955 and Giovanni has run the company since 1975. When Giovanni’s grandfather bought the factory, he discovered a vast collection of semi-buried moulds and dyes. This priceless discovery permits the company to perpetuate a rich artisanal legacy. Very much in the spirit of this tradition, the porcelain making process is entirely carried out by hand, from the creation of plaster moulds up to the finishing brush strokes. For Giovanni an essential aspect of tradition is innovation. Tradition does not rest solely on preserving the past but rather on supplementing this with contemporary fashions and designs. Liquid clay is poured into plaster moulds. Once the moulds have absorbed the water, the fragile objects are closely inspected, then fired. Digitally designed motifs are then transposed by hand on to the white porcelain plates and tray. Liquid clay is poured into plaster moulds. Once the moulds have absorbed the water, the fragile objects are closely inspected, then fired. Digitally designed motifs are then transposed by hand on to the white porcelain plates and tray. First established in the 18th century, Este Ceramiche Porcellane is one of the oldest porcelain manufacturers in Europe. Giovanni Battista Fadigati's father bought the iconic factory in 1955 and Giovanni has run the company since 1975. 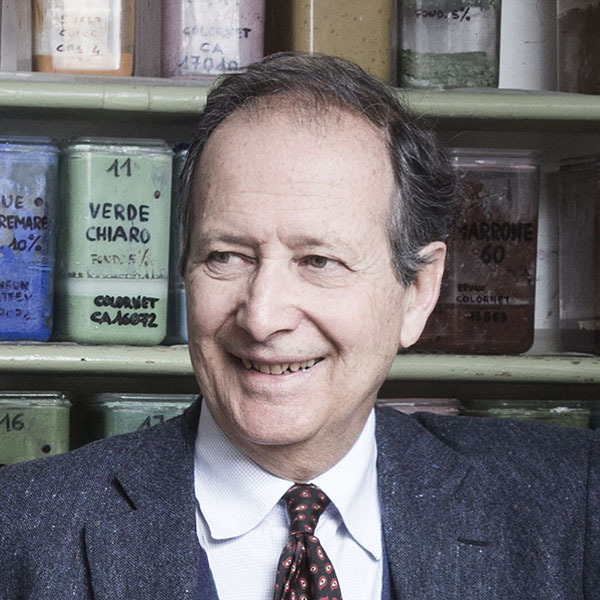 When Giovanni’s grandfather bought the factory, he discovered a vast collection of semi-buried moulds and dyes. This priceless discovery permits the company to perpetuate a rich artisanal legacy. Very much in the spirit of this tradition, the porcelain making process is entirely carried out by hand, from the creation of plaster moulds up to the finishing brush strokes. For Giovanni an essential aspect of tradition is innovation. Tradition does not rest solely on preserving the past but rather on supplementing this with contemporary fashions and designs. Liquid clay is poured into plaster moulds. Once the moulds have absorbed the water, the fragile objects are closely inspected, then fired. Digitally designed motifs are then transferred by hand on to the white porcelain plates and tray. 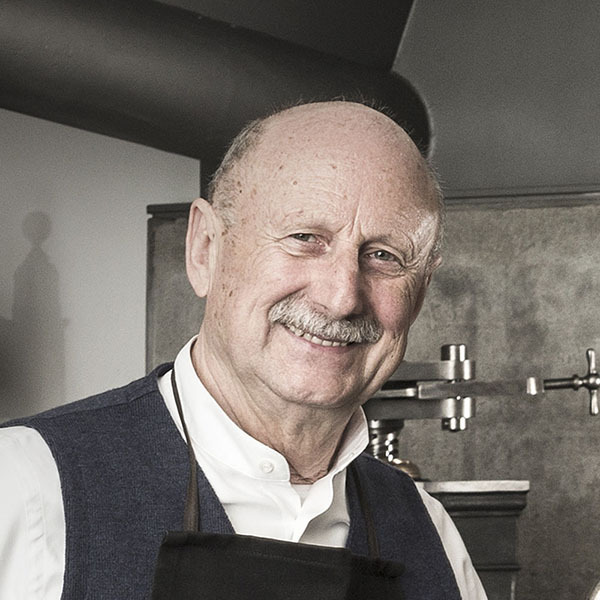 Giovanni Battista Fadigati has managed Este Ceramiche Porcellane since 1975. His two children have already joined him in the workshops. Giovanni’s father, Giovanni Battista Giorgini, a man known in fashion circles, had fallen in love with the workshop on a drive through the countryside and bought it in 1955. He expanded sales by combining traditional elements with fashionable decorations. Today, Fadigati focuses on the same endeavour: innovation that embraces the past. Inma Bermúdez was born in Murcia, Spain, and studied industrial design at the Cardenal Herrera University in Valencia and then at the School of Design in Pforzheim, Germany. In 2007, she founded her studio in Valencia and was joined in 2009 by designer Moritz Krefter. She works for numerous European companies on a range of designs spanning tableware, lighting and decorative figurines. Inma develops classical as well as contemporary products. Both partners complement their work at the studio with teaching at design schools. Inma worked at the Vitra Design Museum workshops held at Boisbuchet in Southwestern France, and was nominated by Architectural Digest a Designer of the Year 2016.